“As my wedding day approached, I lived in a frenzy,” writes Sarah Ferguson, Britain's Duchess of York, in her 1997 memoir My Story, reflecting on her 1986 marriage to Prince Andrew. It’s a book that needs the dust blown off of it ahead of Friday, when Fergie will be front-and-centre at the royal wedding of her daughter, Princess Eugenie and Jack Brooksbank (I insist, you can buy copies for a penny on Amazon). But, particularly, it’s worth revisiting for Fergie’s honest, self-deprecating review of what it’s really like to be a royal bride; the pomp, the ceremony, and particularly the pressure that is placed on appearance. How much has changed since 1986? The process, in many ways, will be largely the same for Princess Eugenie as it was for her mother. There will, forever, be a lot of hands involved. Many of the same people (including the public) will still need to feel pleased with the resulting aesthetic. Sassi Holford, who designed Autumn Kelly’s wedding dress when she married Peter Phillips in 2008, revealed that the Queen likes to see every royal bridal gown before it makes it to the aisle. A heavily pregnant Diana, who was expecting William arrives at the polo with Fergie in 1982. Every tiny element is still totally considered; a fact confirmed this year by Clare Waight Keller, the designer of Duchess of Sussex’s wedding gown, when she revealed the lengths of her collaboration and communication with the bride-to-be. The two had spent sessions perusing the Givenchy archives for inspiration, had developed a unique silk cady fabric together, and had painstakingly selected flowers of the Commonwealth to be embroidered into the veil, plus a Californian poppy to nod to Meghan’s heritage. Royal wedding dresses are expected, still, to be works of art, pieces that will stand the test of time and attract crowds in museums for decades to come. They should symbolise the finest craftsmanship that was available in that era. Who’s making the dress is as important as what it looks and fits like; Fergie chose Lindka Cierach, a young British couturier who had founded her label in 1979, in an attempt to make a statement about the of-the-moment, modern fashion bride she was. Cierach, like every other royal wedding dress designer in history, was not allowed to tell a soul what she was working on until the bride had arrived at the altar. The finer details, for her, too, were as important as the overall impact. Emblems from Fergie’s new coat of arms were embroidered into the dress - a black and yellow bumble bee, an anchor and a rose - and the couple’s initials were sewn in silver beading onto a 17 foot long train that trailed through Westminster Abbey. Excess, of course, was in vogue in the mid-Eighties - that meringue of skirt fabric and those extraordinary shoulder puffs were copied over and over by brides in the years that followed. But Fergie wasn’t the first to do it. If you Google the phrase ‘Eighties wedding dress’ you’ll prompt reams of pictures of Lady Diana Spencer’s enormous 1981 David and Elizabeth Emanuel gown to appear on screen before you may eventually scroll far enough to come across a Fergie snap in her Cierach creation. It was bad luck, really, that her big royal moment in a big royal dress came after someone who was higher up the line to the throne and, in hindsight, she could have used the opportunity to move the bridal conversation on from Diana's look. But at 26, how could she ever have known that? And does it really matter? “All I knew or cared about was that Fergie was in glorious vogue,” the Duchess would write later. That is surely the most important job of the royal wedding dress; to give the bride, whoever she may be, her moment. Fergie was a unique royal bride; one who revelled in the experience of being the most glamorous woman in the world for the day, but who equally understood afterwards that the day, while important, was just a day. Perhaps she will, with that knowledge, be able to advise her daughter how to best enjoy the ride without taking herself too seriously. 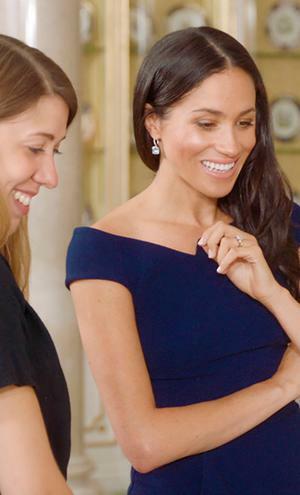 That, and, according to the memoir, she’s got some phenomenal tips on how best to catalogue the 2,000 gifts that the royal bride can expect to receive. She signed the thank you letters herself, you know.